WPI team employs engineering design and 3D printing to create an inexpensive prosthetic flipper that may help animal rescue centers save more injured sea turtles and protect a rare and critically endangered species. Watch video here. Applying engineering know-how to turtle biomechanics, a team of WPI engineering students developed the first ever hydrodynamic biomimetic prosthetic fin using inexpensive 3-D printing, that may help save injured Kemp’s ridley sea turtles, the rarest sea turtle species in the world. 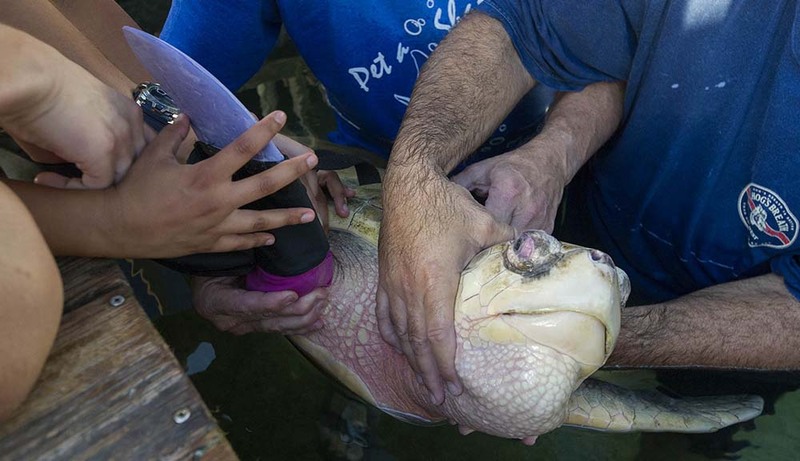 The students’ work with Key West Aquarium focused on Lola, a turtle whose right flipper had to be amputated after it became entangled in fishing gear. The team hopes that rescue centers will emulate their design to help similarly injured sea turtles. Kemp’s ridley sea turtles are critically endangered: there are believed to be as few as 1,000 breeding females remaining in the world. The turtles have an average life span of 50 years in the wild and are found primarily in the Gulf of Mexico. Injuries occur when the animals are entangled in fishing gear, hit by boats, or attacked by sharks or other predators. Maimed turtles are often unable to swim and thus, unless rescued, are unlikely to survive long in the wild. Even among those that are rescued, severe injuries, especially a loss of more than one flipper, sometimes require humane euthanization. Lola was discovered stranded in 2002 in the Gulf of Mexico with fishing line wrapped around her front right flipper. She was rehabilitated at a rescue center for 11 months, and released into the Gulf of Mexico; however, she was stranded again two days later. Several rescue centers and aquariums took care of her before she was settled at Key West Aquarium in 2007. WPI students Iok Wong, Samantha Varela, and Vivian Liang contacted the Key West Aquarium last year while researching their senior capstone project, or Major Qualifying Project (MQP), an intensive, yearlong team project required of all WPI seniors. Through the MQP, students demonstrate the application of the skills, methods, and knowledge of their discipline to the solution of a specific problem. Students work with faculty and advisors to identify, select, and manage their projects, which are conducted at WPI’s more than 40 project centers around the world. The team’s advisors were mechanical engineering professors Brian Savilonis and Yuxiang Liu. For their project, Wong, Varela, and Liang designed flipper to imitate Lola’s healthy limb. They considered various shapes and fabricated several using low-cost silicone and a 3-D printer, and tested them in a wind tunnel. Each student brought his or her own particular skill to the project: Wong, a mechanical engineering major and aerospace engineering minor, perfected the hydrodynamics of the flipper; Varela, a biomedical engineering major, designed a way to attach the prosthetic; and Liang, a double major in biomedical engineering and mechanical engineering, ensured that the design and attachment of the flipper would allow Lola to generate enough force to swim. This prosthetic design is the only one like it in the world because it is biomimetic, made to fit Lola and mimicking the way her healthy flipper moves. Last week, Wong and Varela traveled to Key West to fit Lola with her new flipper. Mader and Greg Gerwin, curator at Key West Aquarium, noted that Lola adapted to the flipper almost immediately, swimming swiftly and smoothly. Key West Aquarium expects to keep Lola in the sea turtle exhibit and use her prosthetic flipper to educate visitors about the plight of turtles and ways human behavior can impact wildlife. They also plan to teach visitors about the application of engineering to help sea turtles like Lola.